I have always been interested in medicinal plants and over the years I have grown a number of them. I also confess an interest in the less honourable members of the garden community and have grown a number of dangerous usually poisonous plants. For a couple of seasons I experimented with Ginseng. 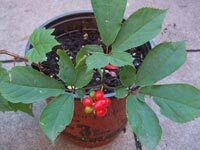 The panax plants are the true ginseng, NOT Siberian ginseng which is just a fraudulently named plant that has nothing to do with the true ginseng. My first experiment with Ginseng was with seeds bought on the internet. These were shipped in little plastic envelopes in peat moss. I tried getting them to sprout but these never came up and I just gave up on that lot as being bad seeds. About a year later I discovered that the seeds had nicely germinated in the refrigerator. It had been over a year and I was (finally) cleaning out my fridge and I came across the little seeds all sprouted. I planted them and up they came. They grew well but not fast. I don't think Ginseng grows very fast in the best of conditions. The little ginseng plants grew to be about 4 mm in cross section. They never flowered the first year and did not live over a particularly nasty winter. I grow things in pots and some plants have trouble overwintering. I think it's the freezing and thawing cycles in the spring that does the most damage. At any rate the ginseng croaked. I later found out that ginseng seeds will not germinate until they have had a nice cold rest, and that keeping my extra seeds in the refrigerator was exactly what they wanted! If you buy seeds make sure that they have had their cold period otherwise they will not come up. What do seeds need to germinate Many seeds such as ginseng have special requirements to germinate. Here is my page on this. 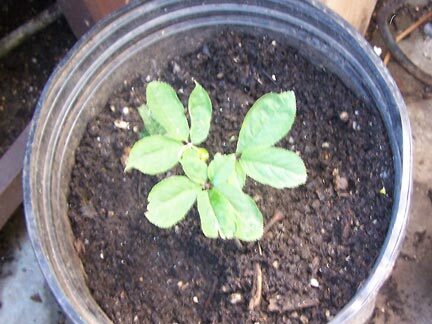 My second and more successful experiment with ginseng was using small but viable roots I bought from the Korean supermarket. These are offered in cello pack and relatively pricey. A small flat was about $10. I know that there are local ginseng farms North of Toronto and I guess that is where they come from. I chose a few likely candidates and used up the rest in juices and salad. It's quite bitter and a little goes a long way. In Korea, you might get a few slices served with a bit of honey. 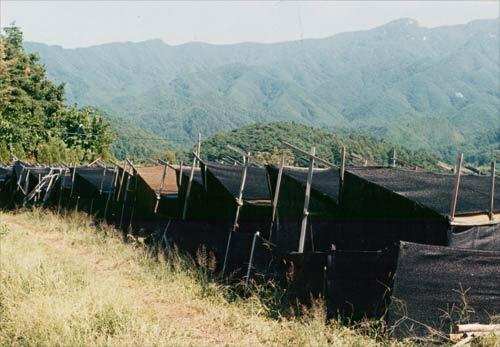 In Wonju where I lived for a year it was readily available and was grown locally in tented fields. 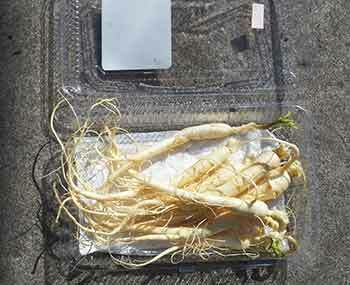 I often saw ginseng farms and tasted the local fresh roots. They were about the same price as here. Pricey but not impossibly so. Since the ginseng I had seen growing was thriving in bright shade, that's where I put my plants. I had potted them in regular soil in black plastic pots I had. They grew slowly, but well enough. 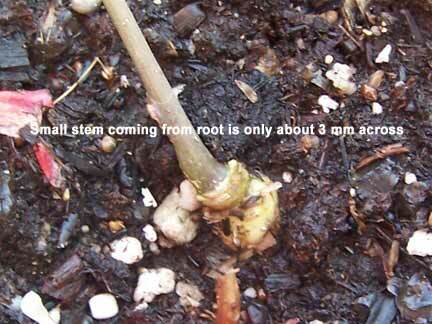 It takes several years to get a sizeable root. My own seedlings had a 3-4 mm thick root at the end of the first year. The plants I got from roots were a bit larger. The roots produced stems readily and soon I had several healthy plants. To my surprise they volunteered to flower and seed. I did not keep any over the winter but with careful placement I'm sure I could have saved them. I have now a cold room that could accommodate these if I chose to grow some more. I took the photo of the black tents, near Wonju in S.Korea. It was the middle of summer. This is completely typical of a Korean ginseng farm. The tents open towards the North. The mountains in the background are Chiak San range. The black fabric is actually a dense screen and lets in some light. The soil around Wonju seems to be quite sandy with not much clay or organic matter. The soil I used had a much higher content of organic matter and very little sand. The plants seemed to grow just fine. Inside the tents it was quite warm and humid and I would be afraid to have mould growing. Maybe that's why there was very little mulch on the ground and the plants were grown very cleanly. 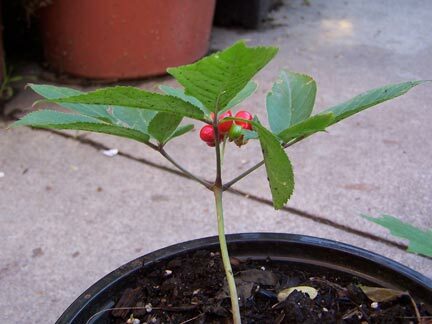 Ginseng is grown in Ontario They have links to several medical articles on the effect of ginseng. Also lots of other information. Ginseng is showing anti cancer properties. Ginseng has been touted as a cure all and highly inflated claims made. When you do your research look for proper scientific research papers from real universities. If a herbal company is making the claims and they are also trying to sell you their ginseng, be suspicious. I really like Holly Phaneuf's book, link on the side bar. There are many suppliers of seeds, Make sure they are STRATIFIED otherwise they will not grow. 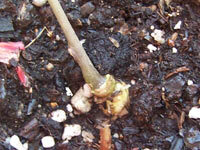 Ginseng needs several weeks of cold weather before germinating. Don't give up it sometimes takes quite a while for the seeds to germinate. Roots are easy to grow. Plant them in a good soil in a bright shady area and they will grow. Written by Holly Phaneuf who is a biochemist who looks at the actual real scientific evidence supporting various herbs. This is one of my favourite herbal books. 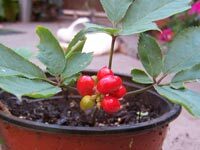 There is a section on Ginseng, but many of the common herbal remedies are also discussed. Well worth the investment.